when copying, printer (Epsom DX3850) only prints half of the page. I have a paper jam showing but have no paper in it!!!!!!!! All the internals look clean is there a sensor i need to clean??? Solution 1: Have had this problem. In my case both XP and Photoshop had been set to control colours. By allowing just one application to control the printing (Photoshop in my case) solved the problem. Solution 2: what you have to do turn on the printer note the print head position,(its been a while)now i think you need to unplug the printer when the print head has moved to the left which exsposes the right hand side and leaves it free,you should notice under where the print head would return some black sponge,apply meths or alcahol based aftershave to the sponge,liberally.turn on printer and the print head should return to the right.now switch off,the print head should drop down onto the sponge.now leave for 24hours.turn on and that should be it.basically the ink dries on the print head and no amount of head cleaning will do it.note everytime you select headcleaning it uses up your ink.i lost many cartriges before finding out this. All problems on this page have been submitted and answered by users. 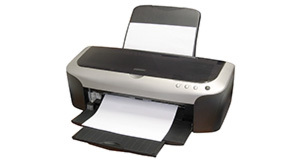 If you have a problem with the Epson DX3850 , please submit it below and we'll post it here. Problem: when copying, printer (Epsom DX3850) only prints half of the page. Problem: I have a paper jam showing but have no paper in it!!!!!!!! All the internals look clean is there a sensor i need to clean?? ?